Concord, North Carolina (February 1, 2019) – Well-known biology graduate turned race car driver and environmental activist, Leilani Münter, has announced her forthcoming retirement from the sport following next week’s ARCA Racing Series presented by Menards season opener at Daytona International Speedway. 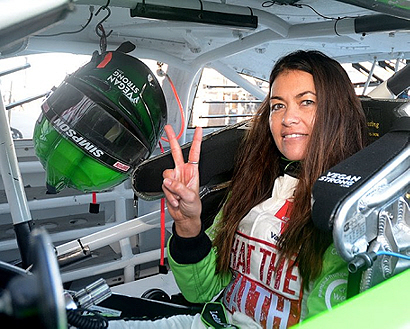 Leilani, 44, entering her seventh ARCA Season, will make her final series start of her career driving the What the Health No.55 Toyota for Venturini Motorsports on Saturday, February 9. Sponsorship support for Leilani’s farewell ride is a collaboration between strategic partners A Well-Fed World and TryVeg.com. What the Health, found on Netflix, is the groundbreaking follow-up film from the creators of the award winning documentary Cowspiracy. Produced by Joaquin Phoenix and Kip Anderson this investigative documentary will be an eye-opener for everyone concerned about our nation’s health and how big business influences it. Leilani, who’s made a total of 18-career ARCA starts since 2010, will be making her seventh overall start on the high-banks of Daytona. The determined driver turned in a personal best effort in last season’s opening event setting career highs after qualifying fifth and finishing eighth. She has recorded two top-10 finishes in 18-career starts. In preparation for next week’s event, Leilani posted the fastest lap time in day one of ARCA open testing at Daytona earlier in the month. Starting out with grass roots racing, Leilani’s career spans 18-years and includes competing in the INDY Lights Series before joining the ARCA Series in 2010. Sports Illustrated once named her one of the top ten female race car drivers in the world. Always racing for a cause, Leilani’s What the Health Netflix documentary joins a long list of environmental or social causes found on the side of the outspoken driver’s race cars throughout her career. Exclusively supporting messages in line with her lifestyle, Leilani is a biology graduate and environmentalist who was named the No.1 Eco Athlete in the World by “Discovery’s Planet Green”. An advocate for plant-based diets, solar power and animal rights, Leilani has made a career racing featuring these noteworthy causes. Her past race cars have included messages regarding renewable energy and clean energy legislation, as well as award-winning documentaries The Cove and Blackfish. Leilani will race off into the sunset one last time in ARCA’s season opener at Daytona International Speedway on Saturday February 9. The race will be aired live on FOX SPORTS 1 beginning with pre-race coverage starting at 4:30 pm ET.